There are several challenges to catching rain in an urban landscape. Renters for example, aren't usually granted the right to cut into downspouts to collect roof run off. And even building owners may find it difficult as downspouts are often either inaccessible or nowhere near the backyard garden. There is also the issue of collecting rain from a tar roof- not exactly the best quality water. So in our minds there is a big market for our product in cities like New York where there are plenty of gardeners but access to rainwater is limited. The product is also applicable to situations such as the following where even municipal water is not easily provided. "Hi Tom, I love (the RainSaucer)...As you can see (my garden) is on a concrete slab but for New York, it is a luxury. There is no faucet back there so my two choices are to run a 100 foot hose from my kitchen sink through the window and to the back or to use the rainwater collected from the rainsaucer. I much prefer the rainsaucer because the kitchen faucet is not very strong and the heavy hose really wears on it. It also involves me yelling to my husband to turn it off so I can keep gardening. The result is that I have grown many herbs, tomatoes, peppers, flowers and 2 luscious eggplants with at least 80% rainwater. I supplement with the hose only when I have run out of rain. 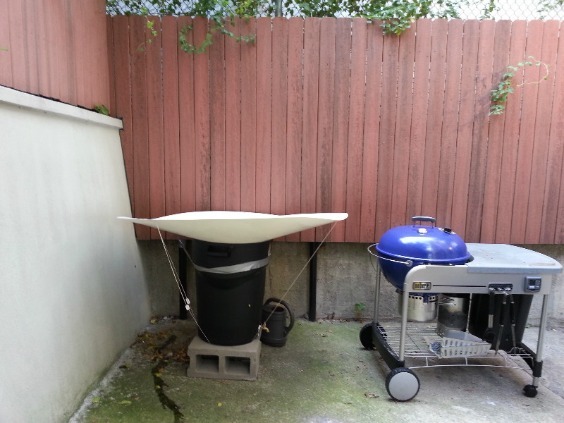 The RainSaucer was a game changer in being able to keep my concrete garden and it has the added benefit of being a water source for us for quick hand washing and general tidying during the barbeques that we have out back. 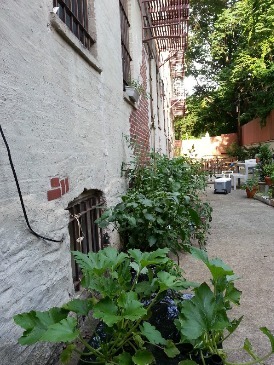 A happy customer grows in Brooklyn!"